We all know the feeling. You're breathing deeply, the air is crisp and you're deeply fantasizing about that trail mix in your daypack. Hiking makes us feel alive. We're able to admire our planet and take a break from our hectic day-to-day. The view from the top of Harding Icefield is often described as a "window into past ice ages." It's the kind of place where climbing to the top makes you feel as big as a giant but the scenery makes you feel as small as an ant. The peak offers sweeping views of bright blankets of snow, icy peaks and a stillness that takes your breath away. Then again, maybe you're breathless from the 3,000-foot elevation gain, but we all know views like this don't come easy! Be on the lookout for mountain goats, marmots and even grizzlies making the ascent look effortless. I don't know if it's the unique landscape, fresh mountain air or over-consumption of huckleberry pie... but every square inch of Glacier National Park feels more beautiful than the next. The Highline Trail is a must-see when you visit. What makes it so special? Instead of climbing and waiting for the perfect 360-degree view, you have it for nearly the entire hike! 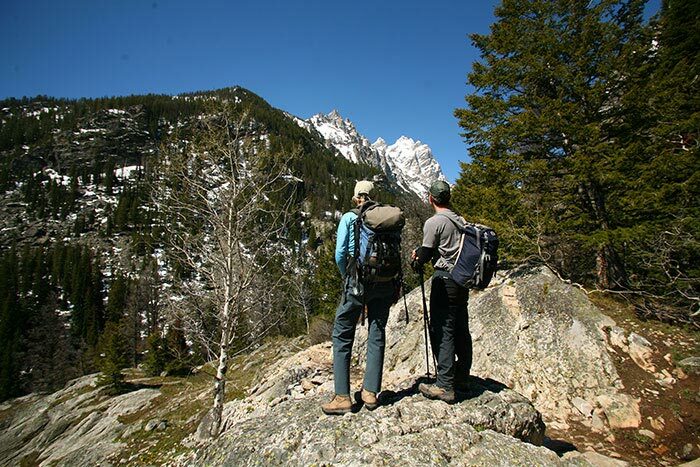 You walk along the continental divide surrounded by crystal-blue lakes, glaciers and rugged mountain tops. If you're lucky, you may even catch some wildlife admiring the scenery with you. Pro tip: Take the 0.6-mile add-on path up to Grinnell Glacier Lookout. It's steep and your legs will be yelling but your eyes will thank you. With 761,266 acres of chill-inducing scenery, Yosemite National Park is tough to match. 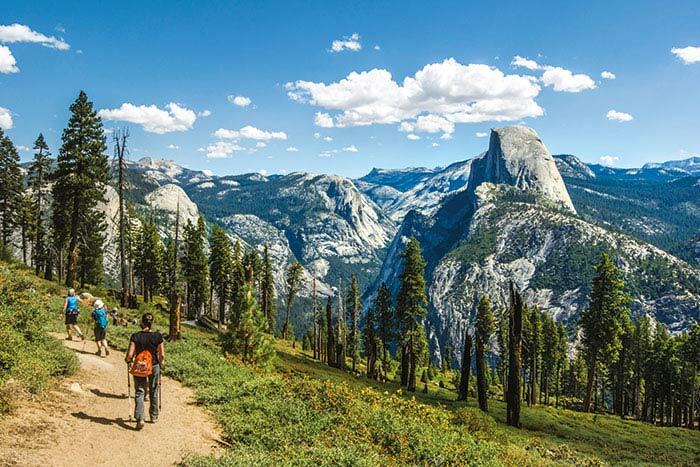 The Panorama Trail offers a smorgasbord of iconic Yosemite views like Half Dome, Liberty Cap and the Valley Falls but is surprisingly less crowded than you might expect. This is the type of hike that replays in your memory and sets the bar for all future hikes. Pro tips: There is a short trail leading to Panorama Point that is unsigned and most people pass right by. This is the highlight of the trail and worth seeking out. Are your legs sore just thinking about it? Hike the trail in the opposite direction: catch a bus from the valley floor up to Glacier Point, in which case the 8.5-mile hike down to the Valley is almost all downhill. Don't let the distance fool you... this hike is about as close as you can get to rock climbing without a harness and carabineers. The Precipice Trail only opens after resident peregrine falcons leave their nests for the season. It's a steep out-and-back using iron rungs and ladders on exposed cliffs. Leave your hiking poles behind, you'll need those hands! 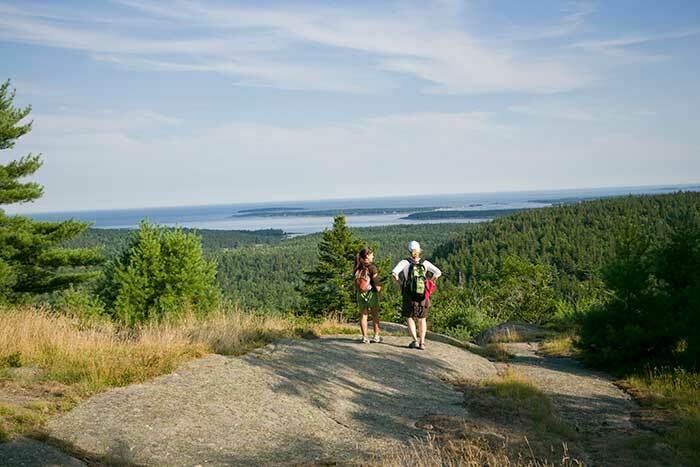 When you finally reach the top, you're offered breathtaking views of Acadia, Cadillac Mountain and the Porcupine Islands dotting the horizon. When we think Hawaii, we often think palm trees, pristine beaches and mai tais. All of the above sound great, but what about some narrow ledges, rugged cliffs and slippery terrain?! The Na Pali Coast is on Kauai's north shore and hiking on the Kalalau Trail is no walk in the woods, but worth every step. The best way to describe the scenery is raw beauty: extreme weather that reminds you Mother Nature is the one in charge, sunsets that put your computer screensaver to shame and rainbows that are a daily occurrence. Being a Virginia Tech alumni I had to include this one. The hike is a section of the Appalachian Trail and a highlight without a doubt. It's a steady four-mile climb with views of the beautiful, green rolling hills of southwest Virginia. The end of the hike offers the perfect "knob" of rock jutting out precariously over the mountainside and a photo-op that would give any mother anxiety. Pro tip: Do this hike in the fall for stunning foliage colors and follow it up with a meal at Homeplace (an awesome family-style restaurant) to replenish those calories... plus some. Get that trail mix ready (or better yet, find a Backroads snack table) and let's go hiking! Thanks for the article. I have a group of ladies wanting to back country hike/camp in July for a week. Various levels of experience and most are fit. Can you suggest a hike that doesn’t require a lot of extra heavy bp equipment( coats, snow equip etc) that would be challenging, scenic and fun with not much traffic during that time. I am experienced along with a couple others and have done Angle’s Landing, so as much as I would like to do again would prefer some other great place. How it the east rim of Zion? Hi Stephanie! How exciting! Backpacking can be such a refreshing adventure. I have never explored the East rim of Zion and have only had time for the big hikes there, although I am sure the whole park is just as breathtaking. In July Glacier National Park in Montana is REALLY beautiful with wildflowers in bloom and the snow melting making most of their trails accessible. This is one of my favorite parks and I would highly recommend looking into different backpacking options here. For the record, “West Virginia” is a state. Southwest Virginia is perhaps you intent. But those are some nice places — done four of the seven, including McAfee. Nice! Yes, looks like a typo! “Southwest Virginia” is the intent.